Everyday Fray: From A & K - We're Going! 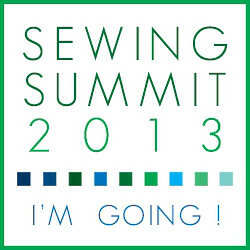 Well it's official, our flights are booked and we're heading down to the Little America Hotel in Salt Lake City, Utah, in September...you know what that means... we're all signed up for Sewing Summit 2013! Neither of us has ever attended a sewing/blogging related conference before so we're both really looking forward to the opportunity to try something new, learn new skills, see a bit of Salt Lake City and of course, meet tons of new sewing/bloggy friends! One of the best parts of blogging is getting to interact with so many sweet and talented folks out in the sewing community, and the idea that we might to meet some of you for REAL is so unbelievably exciting! Are you heading down to Sewing Summit this fall, or know of someone who has? If so please do drop us a line, we'd be so thrilled to meet up! p.s. if you're still thinking of coming, you can get your ticket here (there still seem to be some spots left! ).